WASHINGTON, D.C.– A report issued today by a coalition of community development organizations and financial institutions details how an expired federal tax credit, awaiting congressional action, has spurred private investment in economically distressed communities to create over 500,000 jobs, generate over $5.3 billion in federal income tax revenue and over $3 billion in state and local taxes – an amount which more than covers the cost of the program as measured in terms of revenue lost by the federal government – and revitalize communities across the country. “While there is ample data on the New Markets Tax Credit’s (NMTC) track record of delivering capital to our most challenged communities, there was very little research on the economic impact of the NMTC in terms of jobs created and tax revenue generated, until now,” explained New Markets Tax Credit Coalition Board of Directors Chairman and TELACU Senior Vice President Jose Villalobos. 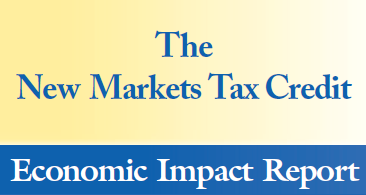 The newly released New Markets Tax Credit Economic Impact Report is the first to measure the aggregate economic impact of NMTC investments over the course of the program. The Report also examines the extent to which the federal tax revenue generated by individuals and businesses benefiting from New Markets Tax Credit investing offsets the cost of the program to the federal government. The federal tax revenue generated by NMTC investments more than covers the cost of the program as measured in terms of revenue lost by the federal government. Through 2010, NMTC investments directly generated over 124,000 operational (permanent) jobs. In 2010 alone, NMTC investments in operational activities generated almost $1.1 billion in federal tax revenue, easily offsetting the estimated $720 million cost of the program for the federal government and providing a 50 percent return on investment. A second New Markets Tax Credit Coalition report, the New Markets Tax Credit: At Work in Communities Across America, was also released this week. This report profiles 92 projects made possible by the NMTC and highlights the individual impacts of each of these projects – to their community, its surrounding areas and nationwide. One such project is Chase New Markets Corporation’s NMTC investment in Peckham, Inc., a nonprofit organization that provides extensive training, job placement, and on-site employment opportunities to persons with learning, developmental and physical disabilities. Peckham also operates a light industrial manufacturing facility for these clients in Lansing, Mich. Chase’s investment financed an expansion of the facility, which now employs 700 with the potential addition of 200 to 300 jobs over the next decade. Download the NMTC Economic Impact Report. 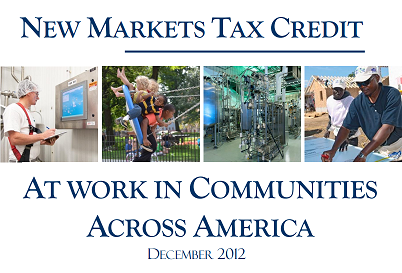 Download The New Markets Tax Credit: At Work in Communities Across America. The NMTC was enacted in 2000 in an effort to spur private investment and economic growth in communities with poverty rates of at least 20% or median incomes at or below 80% of the area median by offering a modest incentive on investments made in these communities. The New Markets Tax Credit was enacted in 2000 in an effort to stimulate private investment and economic growth in low income urban neighborhoods and rural communities that lack access to the patient capital needed to support and grow businesses, create jobs, and sustain healthy local economies. The NMTC is a 39% federal tax credit, taken over seven years, on investments made in economically distressed communities. Today due to NMTC, more than $45 billion is hard at work in underserved communities in all 50 states, the District of Columbia, and Puerto Rico. The NMTC Coalition is a national membership organization of Community Development Entities and investors organized to conduct research on and advocacy for the New Markets Tax Credit. The Coalition hosts two annual conferences and regularly publishes the NMTC Bulletin. To learn more, please visit www.nmtccoalition.org.